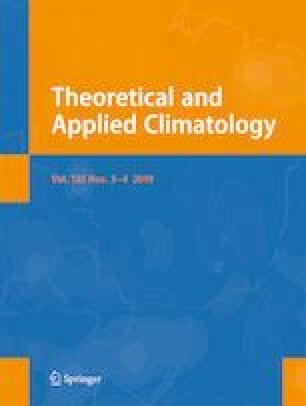 A set of 17 air temperature and relative humidity sensors were used to analyze the temporal variability of surface air temperature (Tair), wet bulb temperature (Twb), and daily snowmaking hours (SM, number of hours per day with Twb < − 2 °C), lapse rates, and the occurrence of thermal inversions at the Formigal ski resort (Spanish Pyrenees) from December to March during three consecutive ski seasons (2012–2013, 2013–2014, and 2014–2015). The Tair and Twb lapse rates showed strong hourly and daily variability, with both exhibiting almost identical temporal fluctuations. The Twb exhibited average lapse rates that were slightly steeper (− 5.2 °C/km) than those observed for Tair (− 4.9 °C/km). The less steep lapse rates and most thermal inversions were observed in December. Days having less (more) steep Tair and Twb lapse rates were observed under low (high) wind speeds and high (low) relative humidity and air pressure. The temporal dynamics of the SM lapse rates was more complex, as this involved consideration of the average Tair in the ski resort, in addition to the driving factors of the spatio-temporal variability of Twb. Thus, on a number of cold (warm) days, snowmaking was feasible at all elevations at the ski resort, independently of the slopes of the lapse rates. The SM exhibited an average daily lapse rate of 8.2 h/km, with a progressive trend of increase from December to March. Weather types over the Iberian Peninsula tightly control the driving factors of the Tair, Twb, and SM lapse rates (wind speed, relative humidity, and Tair), so the slopes of the lapse rates and the frequency of inversions in relation to elevation for the three variables are very dependent on the occurrence of specific weather types. The less steep lapse rates occurred associated with advections from the southeast, although low lapse rates also occurred during advections from the east and south, and under anticyclonic conditions. The steepest Tair and Twb lapse rates were observed during north and northwest advections, while the steepest rates for SM were observed during days of cyclonic circulation and advections from the northeast. We thank the ski resort of Formigal for its support in this research. This study was funded by the research project CGL2014-52599-P “Estudio del manto de nieve en la montaña española y su respuesta a la variabilidad y cambio climatico” (Ministry of Economy and Development, MINECO).